Being in Grassington is like being on holiday abroad. It has quite a foreign quality for a city dweller like myself. I guess this is how foreign tourists perceive England to be - a land of country villages, stone built cottages in cobbled streets and traditional black and white pubs. As you can see from my blog I like to visit that version of England, however it is a different England from the one I normally live in. Grassington is first and foremost a lovely place to visit. 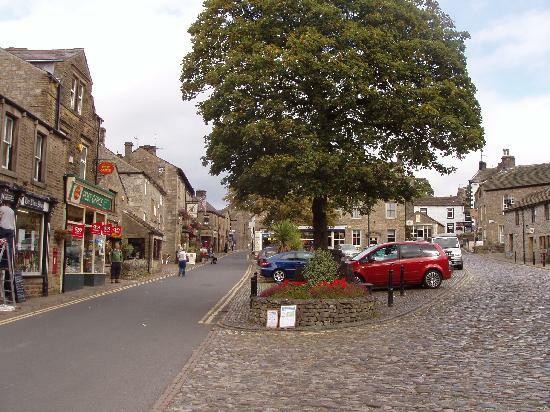 The cobbled square is the heart of the village with its four pubs - The Devonshire Arms, The Black Horse Hotel, The Grassington Hotel (hotel, restaurant and bar) and the Foresters Arms. There are a couple of sweet shops selling vast amounts of fudge, a wool shop, older ladies clothes shop, a geology shop, gift shop, a Spar (but it doesn't sell newspapers by the way), a Barclays bank, a chippy, deli, paper shop, Indian restaurant / takeaway and a hidden Age UK shop you have to look down a side street to find. It is a compact village and it takes about five minutes to get round it. 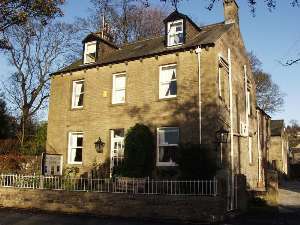 We were staying in Grassington Lodge on the next road to the square. We had found it on Trip Advisor which rated it as the number one place to stay in Grassington. After our two nights there we would highly recommend it too. The room we had was compact, but it was fine for our needs. They have different rates dependent on the room. Ours was one of the cheaper rooms, but the facilities were fine with an en-suite with shower and Molton Brown bathroom products. If booking you do need to watch out as one of the rooms doesn't have en-suite, although it does have a separate private bathroom. After an experience in a Whitby B&B we are always careful to book a room with en-suite. Anyway the room was fine and nicely decorated. The B&B itself was immaculate with classic modern decoration. Too many times we have stayed in places that seemed straight out of the 70s in decor. Clearly the owners take great pride in the B&B and it shows in the way they take care of the place. There was free pre-dinner sherry available and mint chocolates in the hallway. The breakfasts were great with a full Yorkshire breakfast, scrambled eggs and salmon and they also did porridge which wasn't on the menu. They did decaf tea too, which for a non-caffeine person like myself is a blessing. I have to say it was a really pleasant stay and the owners were friendly. Plus there was a little black cat with a spot underneath its chin lurking outside the B&B, which gained extra brownie points from me. Both nights we stayed in Grassington we ate at the Devonshire Arms. We were going to eat in different places, but after the first night we knew we had to come back for the Sunday Steak night. We had a recommendation from Neil's Mum who'd been to Grassington before. The pub had a restaurant area, but it was fully booked up. Thankfully we could still sit in the rest of the pub and still be able to order food. I had a steak and mushroom suet pudding which was divine. The chips were slightly underdone, but I wasn't bothered to complain as the suet pudding was fantastic and more than filling. Neil had the pork medallions in three pepper and brandy sauce, which he loved too. Whilst the Devonshire Arms is an unassuming, traditional black and white pub, the food was outstanding. On the Sunday we had two steaks and a bottle of wine for £25. It was nice, but not as fabulous as the night before. This time we had room for pudding - I had sticky toffee pudding and Neil had cointreau cheesecake. They came out and looked fantastic - and tasted great too. The food is definitely the star of this pub.